This week I felt like eating chocolate. I also was craving coffee. Coffee plus chocolate makes one killer cake. 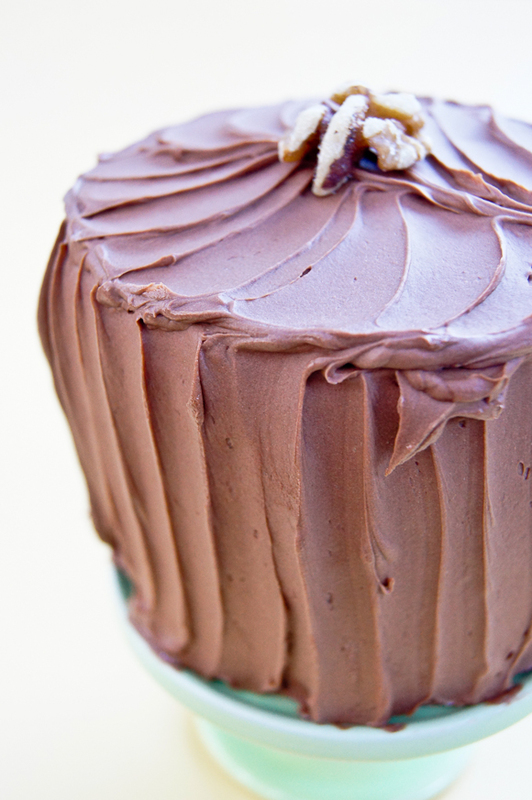 Top that with chocolate buttercream and you got a cake that is a sure winner to anyone that knows chocolate rocks. The catch was that I wanted it now, and I did not want to wait for butter to soften. I hit the Internet and I searched and searched and ended up finding a quick recipe from Ezra Pound Cake who adapted it from The Back in the Day Bakery Cookbook, a cookbook that has been sitting on my amazon list for a couple of weeks now. I made cake. I actually made half the recipe and then I made mini chocolate cakes, because I wanted to use my mini cake stand. The cake hit the spot; it was not too sweet, perfect chocolate flavor with a hit of coffee in the mist. I say that is having the best of two worlds right there in a mini piece of cake. mmm, ready to take those eggs out and get to baking?